group size, adults/children, day/night, half day/ full day and weekday or weekend. Please specify what type of fishing you are interested in when contacting Capt. Dan. It is our goal to supply you with a prompt reply regarding our availability and to answer your questions concerning the rates for the Private Charter you wish to reserve. Keep in mind, the PRIME Sportfishing dates are always in great demand. If you wish to secure a specific date it's best to call early! Please note when booking a charter, that The ORIENT STAR V requires a deposit to confirm your date. We welcome either a mailed check* or accept MC,VC, American Express, DISCOVER or Credit/Debit over the phone. 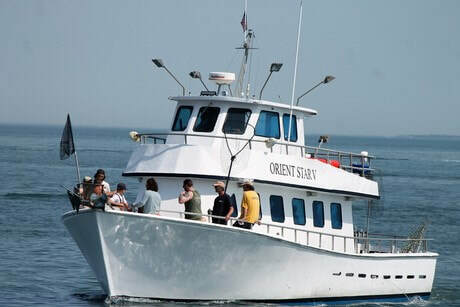 * Please make checks out to: ORIENT STAR CHARTERS, Inc.
​** When booking a charter, our customers find it helpful to know that it is customary to provide your Mate a 15-20% gratuity. ​This gratuity is 15-20% the total cost of your charter and is not included in the cost of the charter.